Korean Air Receives World No.1 In-Flight Meal Award Again. Korean Air received the prestigious `Mercury Award' from the International Flight Catering Association (IFCA) on March 10, 2006 for the development and service implementation of Bibim Noodles (Spicy Korean Noodles), one of Korea's finest traditional dishes, as an in-flight meal. The carrier was awarded the Gold Prize in the Food and Beverage category. This is the second time that Korean Air has won the Mercury Award. The first was in 1998 for the development and service implementation of bibimbap, an assorted vegetable and rice mixture, - as an in-flight meal to its economy class. The IFCA was established in 1980 as a representative body for groups - airlines, caterers and suppliers - involved with the in-flight catering industry. The IFCA with international membership drawn from virtually every country in the world, confirms its position as the largest and most influential body of its type. Awarded at the annual IFCA Convention in Valencia, Spain, the Mercury Awards are acknowledged worldwide as "the original and ultimate recognition of products and services which bring innovation, quality and added value to the industry," according to its organizers. Companies from diverse fields aim to win the prestigious award based on the innovative ideas and service developments to improve the international catering industry for the ultimate convenience of the traveler. 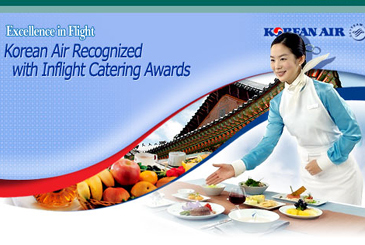 Korean Air's award signifies the carrier's commitment to the best quality in-flight meals and service excellence. The winning entry for the Food and Beverage category, Bibim Noodles, is the latest and most successful development from the Korean Air Catering Center. The spicy noodles and vegetable mix were adopted into the in-flight menu as one the second meal options on long-haul flights after a long period of research and development to ensure that the meal remained fresh and tasty, even during long flights. The Bibim Noodles earned the most points for its quality, innovation and practicality. The Annual Mercury Awards are divided into five categories. The winners of these categories, and the overall winner is chosen from a panel of 13 expert judges whose experience in all parts of the in-flight industry create fierce competition conditions and judging conditions intense. The unique service is offered on Korea~East Coast US lights (New York, Chicago, Washington, Atlanta) and will soon be expanded to Europe and Oceania long-range flights. The Bibim Noodle service is extremely popular not only with Korean passengers, but has quickly become a favored selection among non-Korean passengers as well. Bibim Noodles received praise for passenger in-flight preference after implementation of the service as well as for its continued efforts to provide traditional Korean meals as a way to promote the Korean culture. The noodle and vegetable based meal received great recognition as a health conscious choice creating in-flight diversity attuned to passengers' ever-changing and sensitive needs. In addition to the Bibim Noodle service, Korean Air currently serves various Korean traditional dishes such as the popular Bibimbap (mixed vegetable and rice dish), Bulgogi (marinated beef dish) and Galbi (Korean style ribs) for a total of almost 30 traditional meals. The Korean Air Catering Center continues to research and develop its in-flight meal service for continual service developments as one of the leading international airlines in the world. Earlier this year, in the meantime, Korean Air has won the coveted "Phoenix Award" from Air Transport World (ATW) for successfully overcoming challenges faced by major growing airlines in the global airline industry. The "Phoenix Award" recognizes an airline that has achieved a commercial rebound by changing the way it does business. "In the late 1990s Korean's management decided a complete overhaul was needed and the company began to methodically move in the right direction. Today, Korean's goal of becoming one of the best ten airlines in the world by 2010 is highly credible, ATW said. Previous Phoenix Award winners have been Air New Zealand and Ireland's Aer Lingus. This is the second time ATW has honored Korean Air. ATW named Korean Air Cargo Airline of the Year in 2002. Korean Air flies the world's largest commercial airline cargo operation. According to ATW Editor in Chief, Perry Flint, There was tough competition for the Phoenix Award this year. Korean Air should be very proud of how it's doing. In 2004, Korean Air announced a worldwide vision called Excellence in Flight at its 35th anniversary event. Its mission to become a respected leader in the global airline industry has been challenged time and again, but the airline has always moved forward. "We have proven our ability to adapt to external changes while, at the same time, refining our services to attract and keep customers, enhancing the travel experience and increasing customer perceived value,"said Korean Air Chairman and CEO Y.H. Cho. This award is recognition of our success and provides encouragement to continue our focus toward excellence. Mr. Cho has said his goal is for Korean Air to be one of the world's top ten airlines by 2010. According to ATW, Korean Air's recent achievements make that goal highly credible. Air Transport World recognizes airlines around the world for excellence each year in the awards that were instituted more than 30 years ago. The awards have gained in importance and stature to have become one of the most coveted and valued honors in the airline industry. Besides, Air Transport World is the leading monthly magazine serving the airline and commercial aircraft manufacturing industries. The magazine began its annual awards program in 1974 to recognize excellence in the airline and commercial aerospace industries. Air Transport World is published by Ohio-based Penton Media (OTCBB: PTON), a diversified, global business-to-business media company. In the meantime, Korean Air received strong recognition in the recent TIME Readers Travel Choice Awards 2005 and received a top three ranking in almost every airline category. South Korea's flag carrier beat off strong competition to be selected by Time Asia's readers as the second runner-up in Best First/Business Class, Best Economy Class, Best Services, Best Airline Lounge, Best Leg Room/Seat Comfortability, Best In-flight Entertainment, Best Online Service and Best Frequent Flyer Programme categories. Korean Air was also ranked fifth in the Preferred Airline category. "As this is the first time we have made it into these rankings, we are pleased that Korean Air is currently being so well-received by customers and frequent flyers in Asia," said Mr. Simon Yang, Managing Vice-President, Southeast Asia. The awards are a big encouragement for us as we have been working hard to improve facilities and services for our passengers. It is very rewarding to see our efforts being recognized, Mr. Yang added. Korean Air recently embarked on a major US$1 billion makeover to modernize its facilities and services. While currently ranking as the largest commercial air cargo carrier, Korean Air is aiming to become one of the world's top ten passenger airlines by 2010. In September this year, Korean Air introduced its new uniforms designed by GianFranco Ferre. This year the airline also recently introduced First Class Sleeper seats (Cocoon style), Prestige Plus Business Class seats, new in-flight entertainment (audio and video on demand) and in-flight Internet on long-haul flights. In addition to these enhancements, Korean Air has recently introduced Wedgwood chinaware in First Class on its Europe-bound flights. All of these improvements demonstrate both Korean Air's attention to detail and our commitment to enhancing the passenger experience, said Mr. Yang. We will continue to look for new ways to improve our services and facilities to ensure that flying Korean Air is a pleasurable experience for everyone. Mr. Yang will officially receive these awards on behalf of Korean Air at a Time Readers Travel Choice Awards ceremony to be held in Singapore on Wednesday November 30, 2006. Time Magazine conducted the Time Readers Travel Choice Awards 2005 from April 11 to June 30, 2005. Questionnaires for this survey were inserted in the Asia editions of the magazine (April 18, 26, May 9, 30 and June 31, 2005). At the close of the survey on June 30, a total of 2,193 completed questionnaires were collected and analyzed.